If you read the piece on Javi Lara, you would see that Eibar gave a La Liga chance to a 28-year-old who had just finished his first successful Segunda season. But seven years earlier, Eibar gave a Segunda chance to a 31-year-old player who had never played in the professional leagues. This is a story of perseverance, dedication, and the rarity of opportunity. This is the story of Raúl García Fernández. He is one of the Segunda B's greatest ever players. The third best, some would say - he has played 42539 minutes in the third tier, the third most in the league. It all started in the 1994-95 season, in the ranks of Real Unión de Irún in the Segunda B. Gonzalo Arconada gave him his debut, and at the age of just 18 he was already a regular starter. After three seasons at Real Unión and a season at Racing Ferrol he landed in Barakaldo. For four seasons, between 1998 and 2002, Barakaldo were coached by Alfonso Del Barrio and Peio Aguirreoa. And for all four of them Raúl García was an undisputed starter on the right flank, helping the team qualify for the playoffs thrice (1998-99, 1999-00 and 2001-02) and winning the "title" in Group I of the Segunda B in 2001-02. 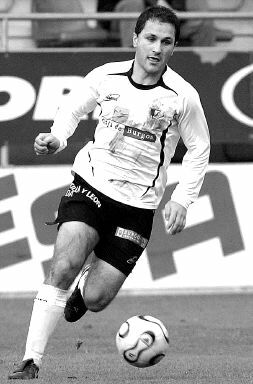 He would have more chances at promotion - he went on to play for Burgos CF between 2002-05, and under Carlos Terrazas (2002-04) and Federico Castaños (2004-05) the side competed in the promotion playoffs in Raúl García's first and final season. And after a season at Palencia, he would rejoin Burgos for the 2006-07 season under ex-coach Gonzalo Arconada, and would compete for promotion, once again unsuccessfully, with Burgos in the 2006-07 season. Burgos have never competed for promotion to the Segunda since. In contrast, Raúl García, at the age of 31, finally got his shot at professional football. 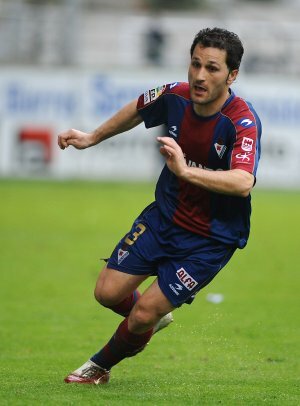 Newly promoted Eibar, under Manix Mandiola, signed several Segunda rookies - but Raúl García was the oldest of them all, and he was an undisputed starter for the two seasons that Eibar spent in the Segunda. At the age of 33, and back in the Segunda B, Raúl García must have thought that his Segunda dreams were over. The Basque native subsequently signed for Mirandés, newly promoted to the Segunda B, since technical secretary Carlos Lasheras knew Raúl García from their time at Burgos three seasons before. He became an integral part of a Julio Bañuelos side that finished 13th and comfortably achieved permanence in the league. From being newly promoted in 2009, Mirandés went on to compete in a promotion playoff in 2011 under Carlos Pouso (who previously coached Raúl García at Eibar), losing to Guadalajara in the final. And in the 2011-12, Raúl García, and Mirandés, enjoyed their best season yet - not just winning the promotion playoffs against Atlético Baleares but also enjoying a dream run in the Copa del Rey, reaching the semi-finals by defeating Amorebieta, Linense (both Tercera), Logroñés (Segunda B), Villarreal, Racing de Santander and Espanyol (all La Liga). He was back in the second tier, for the second time - but Fate played spoilsport this time. During the 2012–13 campaign, 36-year-old García suffered a serious injury to the meniscus on his left knee, being sidelined for two months. And while he scored his first and only goal in the second level - a decisive goal against Girona in a 1-1 draw, he had to leave the club, and playing football, in July 2013. He may have stopped playing football, but he hasn't stopping being in football. In the 2014-15 season he became a technical assistant to ex-coach Carlos Pouso at UD Logroñés in the Segunda B, where he competed, unsuccessfully, in two promotion playoffs to the Segunda (2014-15 and 2015-16 ). And after Carlos was fired he joined the technical secretariat of the riojano side. Eibar gave many a chance. Raúl García was the oldest of them all, but that 2007 summer saw many players who never would have had a shot at Segunda football to get that opportunity. Joseba del Olmo was signed from Sestao at the age of 26, and within a season Athletic Bilbao paid his 300,000 euro release clause to have him play in La Liga. Asier Goiria, also 26, accompanied Raúl García from Burgos and scored 14 goals, also earning a move to a La Liga side (Numancia) within a season. Markel Robles was signed from Real Unión at the age of 28 - a player who Eibar's B team had released just three years before.